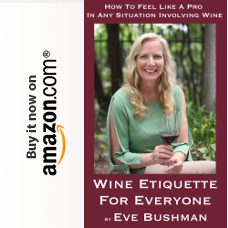 For most of my wine drinking life I’ve espoused the belief that my favorite wine experiences are one-on-one situations with the winemaker, often of a fairly low-budget operation sharing his or her creations with me, sometimes while standing at opposite ends of a barrel or out in a vineyard. I’ve tended to avoid the high end fancy facilities where I’ve worried [sometimes justifiably] that the money went into the architecture and not the wine. From LAW Estate Facebook page. Law Estate Wines continues to shatter that belief on a regular basis. We first tasted the Law wines at the Ojai Wine Festival a few years ago. Winery General Manager Oliver Esparham was pouring their first vintage and we – especially Karen – fell in love with the Law Wines. 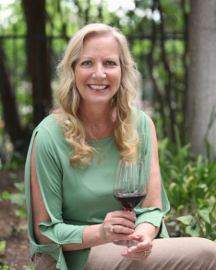 I still remember Karen rushing up to me and telling me “You need to try Law – especially the GSM blend!” She was right; the wines were great. I had no idea what this winery had in the works though. Not too long thereafter, we found ourselves meeting once again with Oliver, this time at the under-construction winery in the soon-to-be-named Adelaida district of Paso Robles. It had now become pretty clear that this was going to be one of those fancy wineries. Yet, I couldn’t really complain, as the wines were definitely awesome. Let’s look at how they got that way. Don and Susie Law followed their passion for Rhone wines from their home in Colorado to Paso Robles, which is known for producing some of the best American Rhones. As geologists, they knew the right soil when they found it, and they built the winery and tasting room to match what they knew were going to be extremely high quality grapes coming from their estate vineyards. 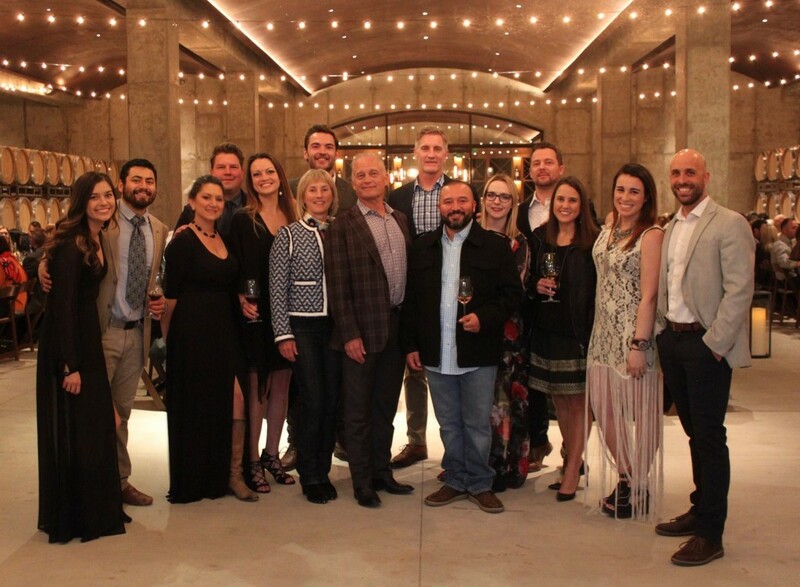 Add to the mix a true superstar winemaker in Scott Hawley as well as a group of some of the best winery employees you’ll find anywhere, and the outcome is no surprise. Never easy to pick a favorite here, as all the wines are truly delicious. Karen’s continues to be the Sagacious blend. I tend to lean toward the complex flavors of the Beyond Category but ultimately I’m a sucker for the Intrepid 100% Syrah. A month or so later, we had the pleasure of attending LAW’s Black Label Release Dinner. To explain a little, LAW has two sets of labels, White and Black. The White Label wines are released in the Fall and if you buy enough [12 bottles in total at least] you get the opportunity to purchase the Black Label wines when they are released early the next year. Now I haven’t noticed a huge qualitative difference between the two labels, at least for my palate; I’m just a big fan of all the LAW wines. That is not to say you shouldn’t buy the Black Label wine too, as there is no reason not to buy all that Law has to offer. And, the perks are pretty good too, such as being able to attend this dinner [which filled up so quickly they had to add a second one]. 2013 The Nines [100% Grenache] paired with Porcini Mushroom Bisque [with Melted Leeks en Brioche, Dried Wild Blueberries, Chive Oil]. 2013 Prima [100% Mourvedre] paired with Oak Grilled California Duck Breast [with Toasted Pearl Couscous, Fennel Confit, Hen of the Woods, Pomegranate Gastrique]. 2013 First Tracks [40% Petit Verdot, 32% Syrah, 28% Cabernet Sauvignon] paired with Six Hour Braised Prime Beef Short Rib [with Truffle Polenta Gratin, Glazed Spinach, Heirloom Carrots, Syrah Bordelaise]. 2013 Sagacious [57% Grenache, 34% Mourvedre, 29% Syrah] with Artisan Sheeps Milk Cheeses, Bacon Jam and Spiced Cherries. Not surprisingly, everything was delicious and the wines and courses were perfectly paired to highlight the nuances of each. The big standout for me was the Prima with the duck, but that’s not really surprising given my fondness for both. I almost forgot to mention that before dinner there was a social hour with appetizers and more great wine, including the debut of the 2015 Soph blend of Roussanne, Marsanne and Clairette Blanche. And speaking of people, it would be very easy for the Law owners and staff to match the fanciness of the winery. But there were no “airs” evident. The Laws are gracious and approachable, as is Scott Hawley. Over the last few years, I’ve gotten to know the aforementioned GM OIiver Esparham as well as Tasting Room Manager Adelaida Pitts and Sales and Marketing Manager Arnaud Fabre. This visit we got to chat with Cellar Manager Pedro Vazquez, whose enthusiasm is infectious. Without them, and the rest of the Law team, being who they are, the wines would probably still be great but the experience wouldn’t be what it is. …enjoy making new discoveries as well as trying the latest vintages of old favorites. 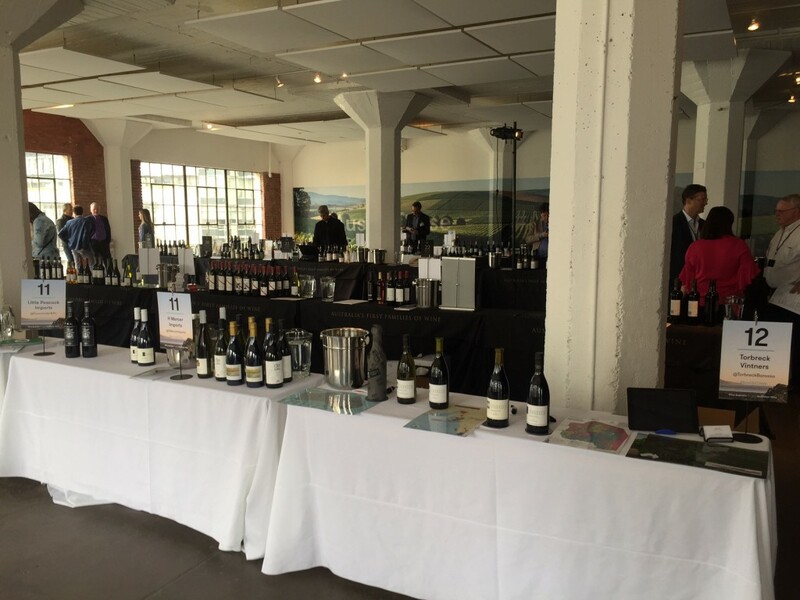 Last week I wrote about the Australian white wine seminar I attended via the Australia Up Close event; what I learned and what we tasted. It got a little lengthy so I split up the story into two parts. Today is what happened the second part of the day, after the seminar, and is limited to all of the Australian red wines that I sampled in a walk around tasting; those that I loved and hope to get my hands on again. My favorites (of those tables I got to as I know I missed quite a bit) are listed below. Wineries part of the “Australia’s First Families of Wine” designation that I liked are noted as an AFF Wine. Cape Mentelle – 2013 Margaret River Cabernet Sauvignon, Cabernet Franc, Merlot blend; 2014 Margaret River Cabernet Sauvignon, Merlot blend. Jim Barry (AFF Wine) – 2014 “1877” Hilltops Shiraz. Peter Lehmann – 2012 “Stonewell” Barossa Shiraz. Wakefield Wines (AFF Wine) – 2013 “St. Andrew’s” Clare Valley Shiraz had a lovely touch of sweetness and great balance. Yalumba (AFF Wine) – 2013 “The Signature” Barossa Cabernet Sauvignon and Shiraz blend. The seminar was informative and tasty. The lunch was a lot of fun and tasty as well. But now Karen and I were ready for the main event. Held in Herscher Hall, the size of the room and the layout of the tasting tables made for a very comfortable and enjoyable experience. For a tasting event of this magnitude, it often helps to have a plan, and I try, but ultimately I seek out a few that I am especially interested in and then just bounce in and out where I see openings at tables. At this event in particular, you can’t go wrong as the quality is always extremely high overall. I skipped some wineries on purpose as I had tasted them recently and many I just couldn’t get to due to time constraints and “palate fatigue.” But I did accomplish the twin goals of tasting great wines and having fun. Bonny Doon Vineyard – I wrote a lot about this winery at the beginning of this article, but still have a little bit to say. 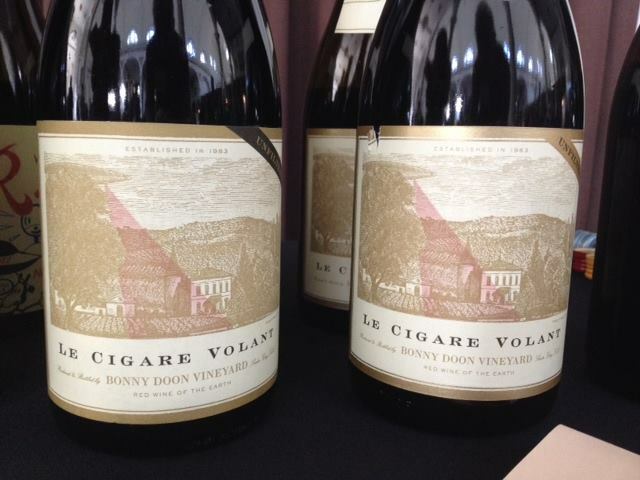 Enjoyed everything I tasted at Randall’s table – 2011 Le Cigare Volant Red Blend, 2011 Le Cigare Volant Reserve Red Blend, 2014 Clos de Gilroy Grenache, 2014 Old Telegram Mourvedre, 2011 Bien Nacido Vineyard “X-Block” Syrah and the 2013 Le Pousseur Syrah. A big thank you to Bonny Doon Director of Sales Keith Shulsky for the taste of the 1990 Old Telegram, which showed how well Mourvedre could age. 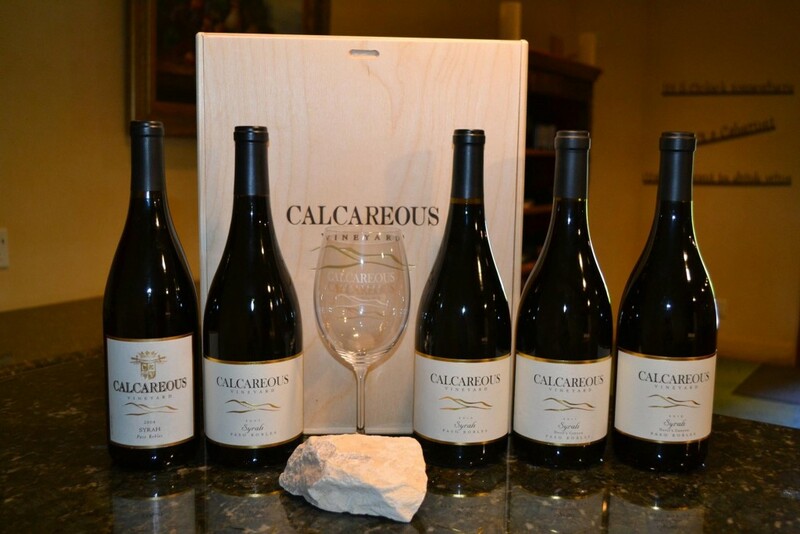 Calcareous Vineyard – the Tres Violet [Syrah, Grenache and Mourvedre] and the Moose [Syrah and Petit Verdot] are typically my favorites from this winery. The 2013s were being poured this time – they were both outstanding. I picked the Tres Violet as my fave, barely. Cass Vineyard & Winery – Ted Plemons was stealing the show as usual, but he couldn’t over shadow the wines he was pouring. Especially liked the 2014 Mourvedre. Chacewater – I’ve become a fan of this winery fairly recently. The 2013 Syrah, 2012 Petite Sirah and 2010 Astel Petite Sirah were all very tasty. As an added bonus, these wines are extremely well-priced. Epoch Estate Wines – Full disclosure here – I’ve been buying these wines since their first release. I had no real reason to taste them at this event, except I knew they would be really good so what the heck, right? And I was right…2012 Ingenuity Red Blend and 2013 Estate Blend were both outstanding. 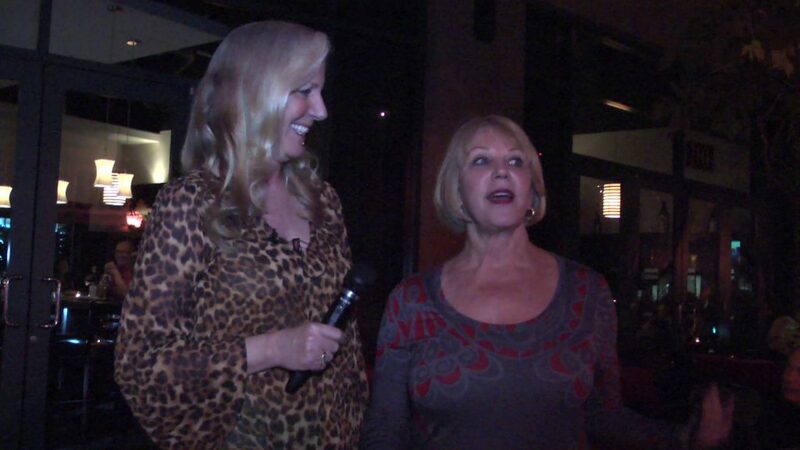 Four Brix Winery – it was nice to see Gary Stewart and taste his wines. Especially enjoyed the 2011 and 2012 Rhondezvous Blends. Both were made from Paso Robles grapes and for some reason evoked in me a fond memory of visiting Paso in a more relaxed time back before the wine industry really took off. Very nice. Kale Wines – Tasted Kale’s Grenache based wine at the seminar; it was a pleasure to taste the two he was pouring at the Grand Tasting. The 2013 Kale Home Run Cuvee from the Kick Ranch Vineyard was outstanding and the 2013 Kale Broken Axle from the Stage Coach Vineyard was even better – my favorite of the day! 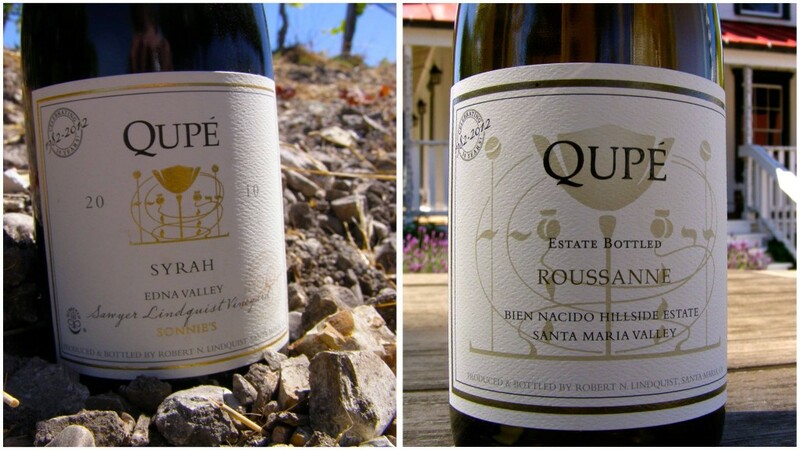 Qupé – Santa Barbara County legend Bob Lindquist was pouring several wines, including two excellent Syrahs – 2012 Sawyer Lindquist Vineyard “Sonnie’s” from their vineyard in Edna Valley and 2011 Bien Nacido Hillside Estate, Santa Maria Valley. Ridge Vineyards – the Ridge wines are always good, but a real eye opener for me was the 2014 Carignane from the Buchignani Ranch. I had to ask if it was 100% Carignane as I don’t think I’d had one that rich before it – it was. 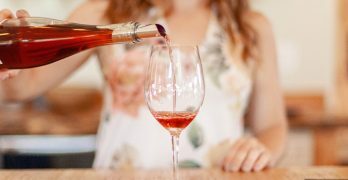 Rock Wall Wine Company – I haven’t seen winemaker Shauna Rosenblum in some time; I expect her young family is keeping her very busy. While the tasting table might not be as entertaining when she is not there, the wines are just as good as ever, especially the 2012 Le Mur de Roche Petite Sirah. 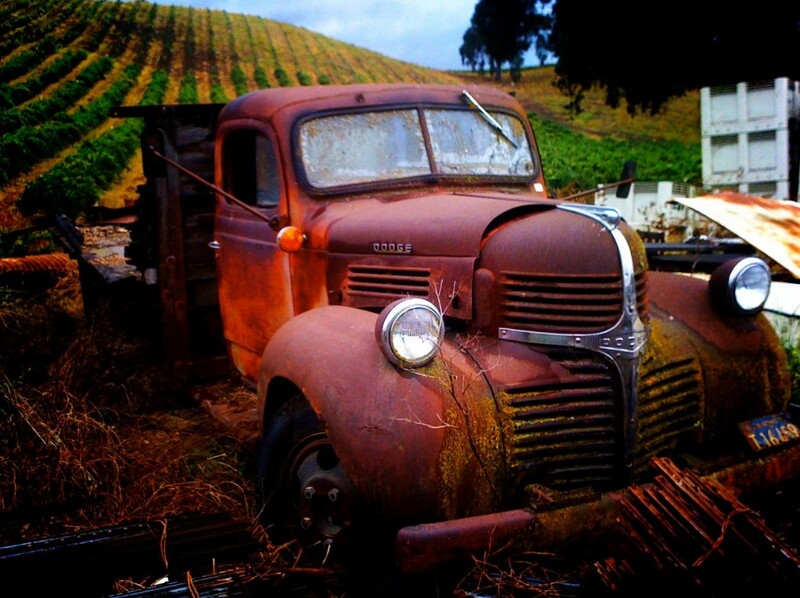 The Withers Winery – based in Santa Rosa, the grapes for these wines were from El Dorado in the Sierra Foothills. Cooler climate and lighter in style, I recommend the 2013 Ruben Mourvedre Blend and the 2013 Mr. Burgess Syrah Blend. 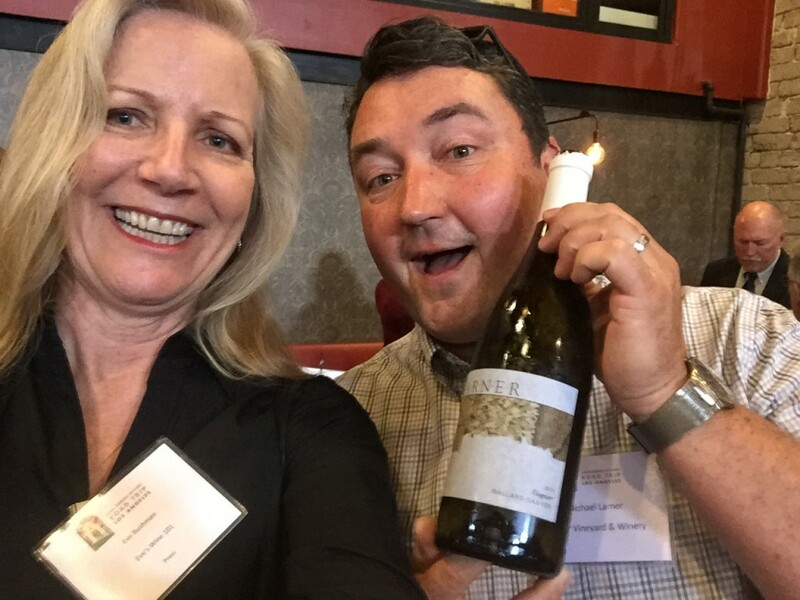 Two Shepherds – I wasn’t planning to taste at William Allen’s table this time, as I had tasted his wines at Hospice du Rhone in Paso Robles and most recently at the Garagiste Event in Los Angeles. But, when he told me he had an orange wine for me to try, I couldn’t help myself – I’ve become a fan of orange wines of late. If this is a new term for you, let me try to explain at least what my understanding of them is, which may or may not be 100% accurate. Wines generally get their color from the grape skins, not the color of the juice. White wines are typically made from juice with little or no skin contact. Wines made from grapes traditionally used for white wines but made with extended skin contact will have a slightly orange hue to them, hence the term. They also have a level of complexity which I enjoy. In this case, it was the Two Shepherds 2013 Centime, a miniscule 35 case blend of 66% Grenache Blanc, 17% Marsanne and 17% Roussanne, fermented with skins and stems. Excellent wine. Thanks to the Rhone Rangers and the participating wineries for putting on a great event and for finding an excellent venue in the Skirball. Hopefully, this will be the home of the event for years to come. 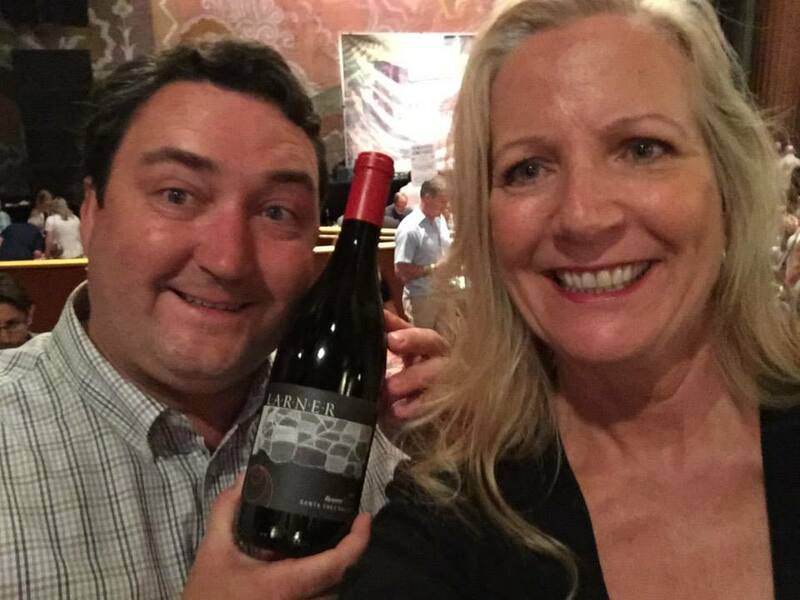 Eve and Michael Larner of Larner Vineyard and Winery. As I’ve said before and will say again: One of the best ways for wine 101ers to learn about wine is to do a comparative tasting of the same grape or region. This time it was wine only from the Santa Barbara AVA, and to narrow it down further, I only did the Rhone portion of the tasting that included Viognier, Marsanne, Roussane, Counoise, Petite Sirah, Grenache, Syrah and Mourvedre (the last three often blended together and referred to as a GSM). Wine 101 note: Rhone wines traditionally come from Rhone, France, where only certain varietals are allowed to be grown and turned into wine. Of course someone living in the Rhone valley could plant a grape that isn’t considered the best for the terroir (soil, climate, etc.) but they wouldn’t be allowed to sell it commercially. Now, back to this stateside tasting. A few fun photos can be seen here of my afternoon at LA’s Republique restaurant tasting all things Rhone from Santa Barbara County. And my favorites of the day are listed below in bold, however, I didn’t make it to every table. Beckmen 2013 Syrah, Purisima Mountain Vineyard, Ballard Canyon AVA blend of Grenache, Syrah, Mourvedre and a bit of Counoise. Bien Nacido 2012 Estate Syrah, Santa Maria Valley. Casa Dumetz with the lovely-as-always winemaker Sonja Magdevski pouring at least two that I thought were very pretty: 2014 Grenache, Santa Ynez Valley and 2014 GSM, Santa Ynez Valley. Central Coast Group Project (CCGP) Really big: 2012 “Names” Syrah, White Hawk Vineyard, Santa Barbara County. And on the huge scale: 2012 “Barrington Hall Wine Dinner Special Cuvee” (so named after wine dinners Scott Sampler attended in college) GSM, Santa Barbara. Larner 2014 Estate Viognier was a wonderful mix of refreshing fruit and vibrant floral, and my fave white of the day. Followed that up with Michael Larner’s 2011 Estate Syrah, Ballard Canyon. Margerum 2015 Riviera Rose, San Luis Obispo and Santa Barbara County was my fave Rose of the day. But I didn’t stop there, I also enjoyed Doug Margerum’s 2013 Grenache, Santa Barbara County; 2013 Syrah “UBER”, Santa Barbara County; 2014 M5 Rhone blend of GSM, Counoise and Cinsault, Santa Barbara County. Sanger Family, pouring their Consilience label, shared at least three wine I thought were great: 2013 Syrah, Santa Barbara County; 2013 Viognier, Santa Barbara County; 2013 Grenache Blanc, Santa Barbara County. Stolpman, poured by Jessica Stolpman, had a perfect line-up – as I had tasted them all recently. But I still enjoyed tasting them all again, including the 2013 L’Avion, blend of Roussanne and Chardonnay, Ballard Canyon and the 2014 Grenache, Ballard Canyon. Tercero was my first stop as winemaker Larry Schaffer was free when I walked in. Another I had tasted recently, it didn’t stop me from enjoying (again) his 2015 Mourvedre Rose, Happy Canyon of Santa Barbara; 2014 Verbiage Blanc blend of Roussanne, Viognier and Grenache Blanc, Santa Barbara County; and a lovely Verbiage Rouge red blend. Zaca Mesa is an old favorite I used to love to visit and I was not only happy to revisit, but to discover two new wines to enjoy: 2012 Z Blanc, Santa Ynez Valley and 2011 Mesa Reserve Syrah, Santa Ynez Valley.